Beatrice “Betty” Daniels died peacefully on Friday April 5 at Orchard Hills Assisted Living in Eau Claire. Betty was born on May 2,1925 and was raised with her sisters Shirley and Donna and her brother Bob by her parents Carl and Blanche Sneen in Eau Claire. 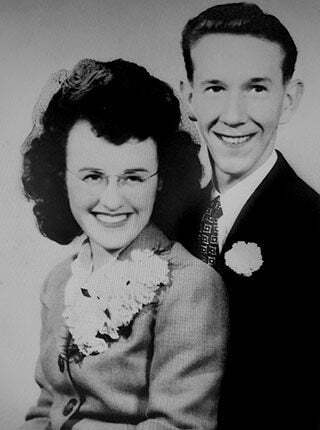 Betty graduated from Eau Claire Senior High School in 1943, and in 1944 married Frank Daniels of Eau Claire. Betty was a stay at home mother who took care of her 5 children until all of them were in school. She then worked part-time for the Eau Claire Press Company Leader Telegram in the circulation department. During this time, Frank worked at Uniroyal in Eau Claire where he and Betty had many good friends. Frank and Betty celebrated 65 years of marriage before Frank’s death in 2008. Betty remained in the family home on Fairway Street until 2014 when she moved to Owen Rust Apartments to be closer to her son Jim. Betty made many friends at Owen Rust. She enjoyed making breakfast every day for Jim, going out for pizza at Sammy’s, fish fry’s on Fridays, spending the 4th of July at Birch Point Resort, grocery shopping and lunch with June on Saturdays, and going on occasional bus trips to Turtle Lake. Betty lived independently, while still driving her car until last December when she was 93. Betty is survived by her 3 daughters; Jeanne Thompson of Chetek, Janet (Kirk) Lawler of Osceola and Judy (Tim) Anderson of Mississippi. She is survived by 6 grandchildren; Eric, Amy, Ryan, Kyle, Ian and Adam and 5 great grandchildren, Addison, Annah, Amelia, Lily and Aidan. qShe is further survived by her sister Donna Dickson of Eau Claire, nieces, nephews as well as her friend of 60 years June Parizo. Betty was preceded in death by her husband Frank, her sons John and Jim, her parents, brother Bob Sneen, sister Shirley Sneen, son-in-law Larry Thompson and many good friends. Betty enjoyed a long life and her independence until just 4 months before her death. She especially missed her son Jim who died in January of this year. Betty’s daughters wish to thank all of Betty’s friends at Owen Rust, the staff at Orchard Hills, and the Mayo Home Health and Hospice team for the care and comfort of Betty and her family. Betty and Jim will be buried alongside Frank and John on June 8, 2019 at the Lutheran cemetery on Omaha Street in Eau Claire. There will be a graveside service for them both and lunch following the service.